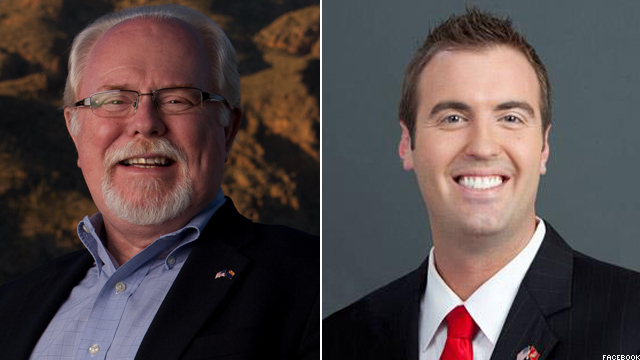 (CNN) - Democrat Ron Barber won a special election in Arizona on Tuesday to fill the remainder of former Rep. Gabrielle Giffords' term in Congress, CNN projects. On Wednesday morning, official results showed Barber with 52% of the vote, while his Republican opponent Jesse Kelly was at 45%. In 2010 Kelly, a former Marine and Iraq war veteran, challenged Giffords but came up 4,000 votes short. "Just about 10 minutes ago I received a call from Jesse Kelly," Barber said. "It was a most gracious call. And Jesse said, 'congratulations on your victory and I know you will make a great congressman for Arizona.' How about that?" A former Giffords aide, Barber was critically injured during last year's mass shooting that killed six and injured 13 others, including Giffords, who suffered a gunshot wound to the head. She resigned in January, about a year after the shooting. Giffords, along with her husband, Mark Kelly, stumped for Barber this weekend in Tucson, making a rare public appearance as she undergoes rehabilitation in Texas. She also accompanied Barber as they cast their ballots Tuesday. While special elections during the summer generally drum up little attention, the Arizona race gained high-profile status because of the interest surrounding Giffords. It also marked the final Congressional election prior to November. Outside money poured into the race from super PACs supportive of both sides. The Republican National Congressional Committee as well as the Democratic Congressional Campaign Committee each ran ads in the state. Both campaigns centered around jobs and the economy, with the Republican candidate taking a national approach. Kelly made defeating President Barack Obama part of his message, as his supporters attempted to turn the race into a referendum on the president. Barber, a moderate Democrat, was mild in his support for Obama due to Republican leanings in the 8th Congressional District. The district has voted red in the past three presidential elections. He instead, largely crafted a local message of helping the middle class in Southern Arizona. "I'm focused on, what are the issues here? What are people concerned about in Southern Arizona? They tell me plenty about that, about middle class concerns, about seniors who are concerned about veterans," Barber said Monday on CNN's "Piers Morgan Tonight." "They want someone to go to Washington who is going to be focused on their issues." While Barber has won the seat, he will only hold it for six months and will have to start running for re-election almost immediately. In the fall, district lines in Arizona will move slightly and will become more amenable to Democrats, though still competitive. good news! it was awful to think that a seat would switch party based on an assassination attempt. let's cut through the bull, the only reason why he won is because Gifford got shot in the head. people are sick of all the liberal pish posh. Atta boy barber..congratulations. Now it's Obama's turn to win in Nov. Obama 2012! I'm not taking sides on this one, it could have gone either way – but it seems attempting a broad national "anti" Obama message really didn't fit into a more local race – I think Barber(D) made the smarter move in focusing on local issues; If the GOP goes into November on just an Anti-Obama platform, I really question if they can win. Eric Holder, leave Arizona alone. They will be fine without your stupid teams over there. Ok. Please don't get me wrong here. But why is it that Gifford got all the publicity. There were 13 people injured from the incident and 6 died from it aside from the 13 injured. Yet all the publicity has been about her. Why haven't we seen more coverage about the other people. Why does she get all the coverage. She was a public servant the other people were voters. Family member and loved ones. Good news here. Ron will continue to do the good work that Gifford's started. And what's his qualifications again please? Barber supported the President and even announced that he would be voting for him. Totally unexpected but sooo welcome. For those who supported Kelly, please begin being reasonable and not hating others. For those who don't live in the district, you have no idea about the nastiness of this man. Big defeat for tea party. Figures that CNN would bury this story. Good, there are still some normal people in the state of Arizona ,I'm sure they don't listen to the fox dope channal !! Let's just hope that this trend will be repeated in november when we can vote all radical republicans out of office. Congratulations to Ron Barber, he will be a great Congressman. Thanks to all who voted for him and this is a great sign that MAYBE Arizonans are finally waking up!! Congrats Mr. Barber. Too bad this did not happen in Wisconsin. I know you will represent Arizona well and follow Ms. Giffords vision. Nice to see not all Republicans have bought into the partisan politics the GOP uses as its Mantra. Kudos to the voters for putting their State above their Party. This gop contender looks like the new crop of gop fascists. They are all intechangable. One more GOP contender has failed, by even a larger margin than before. Here's hoping the voters continue to reject the party of "no" in the November election and there comes a time when a Republican can't even get elected as dog catcher. A republi-can't leaning district goes to the Dem. There is hope for America yet. This is not a surprise and probably a good thing. This was a sympathy vote. Everyone is saddened when Democrats shoot their own, as is usually the case. Republicans were just as sad and upset to see someone in service to our country shot like this. I think for this shortened term, re-electing a Dem to fill the spot, especially someone who was also a victim of the Democrat shooter, is more than proper and fitting. We can get this past us, and in the next vote put a fiscally responsible Republican in the seat.